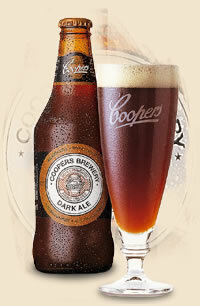 Has anyone ever tried Coopers 'Original Pale Ale'...otherwise known as 'Green Cap'? The P clearly rate it...see Thes on the front cover of Fun DMC! I recently went to a brewery (RaW Derbyshire Brewing Company) owned by friends to make a beer for my wedding and since that day the long-dormant real ale lover inside has been rewoken. I'm a big fan of anything super-hoppy and pale though if its wet I'll drink it. Had my first pint of Odell recently at a pub in Pimlico and though it was 6 quid a pint it was worth every penny. Anyway, me and my brother are starting homebrewing this weekend with our own recipe on our own kit built from bits of old fridges and picnic hampers. We're making a hoptastic 8% or 9% pale ale with all american hops which if it turns out according to plan will be a thing of beauty. AGP - where did you go to brew beer for your wedding? I have a stag do to arrange next year, sounds interesting! Yeah in the Wiz track they praise Coopers! I love Brewdogs beers. You have awesome taste AGP. I recommend this to you and all..my favorite brewery : http://www.nogne-o.com/ . Should be available in better liquor stores. I bought 3 bottles of their 18% Tokyo a while back, and still got 2 left! Not an everyday beer, but an interesting drop...I'd say it's a cross between stout and port...so not to be taken lightly! Good luck with the brewing AGP, I tried it with mate a couple of years ago and it was all going so well until I sampled what we'd brewed a few weeks later...not a pretty experience! Once my friends bought me a beer hamper from a hamper delivery in uk with different beers from different countries for my birthday. I love to test different ones. I think my favorites were from Germany and Czech Republic! I also tried a beer blended with honey flavor at a Medieval Festival which was also quite nice, as well as a beer with cranberry. Thanks for your recommendations here. I will check the websites! Funny you should bump this topic. Last weekend, I bought a sixer of Cooper's Sparkling Ale at a steep $14.99 plus tax. I get home, drink one, go "Man, this tastes funny hmm". I look at the bottle and the "drink by this date" on the bottle is from 2009. LOL. WTF. I paid top dollar for some beer from 3 years ago. Needless to say, I'm headed back to the shop I bought it at to try and do a swap, I mean WTF. Who puts beer from 3 years ago on the shelf. Motherfuckas. I think my favorites were from Germany and Czech Republic! Home countries of beer. Nuff said. Check out what rolled in this morning (full case of 24). Looking forward to sampling it for the first time...whilst listening to Fun DMC for the umpteenth time. Is it hard to get a hold of in the States? I live in the city where it's brewed (Adelaide) so it's like water here. I'm in the UK - but yeah, its pretty rare. I've had a few cases of the sparkling before but this is the first time I've managed to get the pale at a decent price. How do you rate the Dark Ale, Extra Stout & Vintage Stout? I've found somewhere else that sells them...but its not cheap. It also sells the Little Creatures Pale Ale which I've had before and really enjoyed. Again though, its not cheap.